Ground slate ulu blades in progress. Source: Tim Rast, Elfshot. I’ve mentioned before the terrific Back East archaeology blog Elfshot, in which Tim Rast documents his journey of “making a living as a 21st century flintknapper”. Flintknapping is all well and good, of course, but the real magic lies with ground stone, which for many years has been marginalized in archaeology as being, well, obvious and uninteresting. I think one paper I read digresses with an anecdote about the author’s toddler son independently inventing the technology! If it is so obvious, though, then why is it only selectively implemented by people in certain environments, at certain times, to certain degrees of intensity? Selection of Ulus. Source: sila.nu . Anyway, how can we understand ground stone? Unlike chipped stone technology, there are not usually a large number of waste flakes produced in the manufacturing process which track the decision-making sequences of the crafts-person. Rather, one tends to find finished pieces, grinding stones, and a selection of ambiguous tools also used in the process. Most of the manufacturing traces disappear as rock powder. If there is a topic on the NW Coast that is as under-studied as grinding stones, I’d like to know about it. Now that it is possible to, for example, extract lipids from Fire Cracked Rock and ground stone, there really is no excuse not to really bear down on ground stone technology, which must be plastered with organic residues. (Incidentally, if you have access, Thoms outlines the problems and prospects in Fire Cracked Rock studies). But another way to address this technology is to try to understand the constraints and possibilities of manufacturing, via replication and experiment, and this is where Elfshot shines. Experimental nephrite drill bits and bi-conical holes in slate Ulus. Source: Tim Rast, Elfshot. In a recent series of posts, Elfshot nicely illustrates making ground slate knifes (a hugely important artifact type on the Northwest coast as well) of the Arctic style, including the use of nephrite drills to make lashing holes through them. Nephrite, or “jade” is also a very important raw material on this coast and it is good to see this experimental program. I’ve messed around with some experimenting during the course of my day job, and one interesting finding was, generally speaking, ground slate was faster to make stuff from than was ground mussel shell. I never thought of using nephrite drills of course, but we should be on the lookout for stone drills on the NW coast: something is making holes in all those ground stone beads. There’s a short video of Rast using a bow drill on stone at this Elfshot post (scroll down halfway). So, lots of credit to Tim Rast and Lori White for such a grounded demonstration of interest in this topic. Out here, I can point to 1990s M.A. theses by Darwent and yours truly on ground stone in B.C. More recently Jesse Morin (PDF by subscription on fish cutting; shorter PDF on nephrite circulation) at UBC and Anthony Graesch (PDF download) from UCLA have started to really get to grips with material choice and circulation of those raw materials most suitable for making ground stone artifacts. In a niche where fish processing was arguably so important, the making of specialized fish knives is obviously of massive interest – and choice between, say, the very different operational sequences imposed by ground slate, by mussel shell, or by cortex spall tools has only just begun to be thought about. The same applies to ground slate points and adzes/chisels, etc. In short: why bother? What are the advantages? Be precise. Show your work. It’s not too hyperbolic, I don’t think, to propose that understanding the daily grind on the NW Coast might end up being one of the most important keys to unlocking the secrets of the late Holocene archaeological record. And, of course, to return to Elfshot: part of the “making a living” as a flintknapper is to sell your reproductions. Elfshot has a gallery of things for sale. I can think of more than one NW Coast archaeologist who would rather have one of these pieces for an anniversary than some useless trinket, diamond, whatever. You can also follow Elfshot via facebook or twitter. 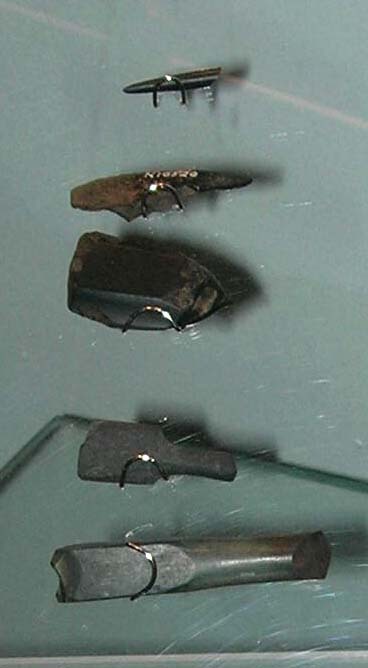 Experimental reproductions of Fraser River ground slate knives, similar to an archaeological specimen found waterlogged - see Bernick 1994 in The Midden. 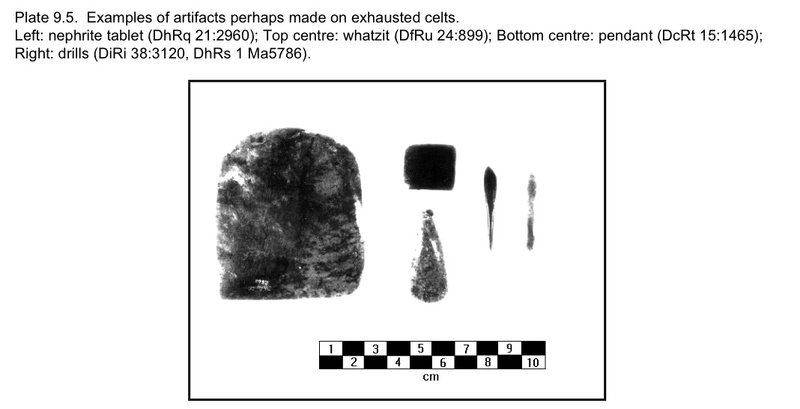 Source: Morin 2004, Canadian Journal of Archaeology. This entry was posted in Archaeology, Technology, Uncategorized and tagged elfshot, experimental archaeology, ground stone, replications. Bookmark the permalink. Thanks Quentin, I love hearing about the west coast correlates for the tools we are finding out east. Morin’s slate knives are very interesting, I was just sent photos of some Archaic semi-lunate slate knives from Labrador and couldn’t quite picture them hafted – but if they were backed with a wood handle, they’d be dead ringers for the ones in Morin’s experiment. I also didn’t realize that nephrite drill bits don’t show up in B.C. You’ve certainly got the material – the bits in the photo are actually made from B.C. nephrite. I’ve heard from others that nephrite drills don’t show up in the Western Arctic either. I’m curious now about when and where they were made. It seems like they have a more limited range than I’d expected. Thanks for the blog plunder, by the way – I just recycle content here but you are out there making new content which is amazing. OK, drills, I should have said, on the lookout for more drills (can’t even remember my own work, such as it is) – I noted a few nephrite drills in my MA thesis (see below) and there may well have been more considering my sample selection procedure was basically to look at every single tray from Coast & Strait Salish territory in the RBCM and UBC and SFU and a few other places too, and pick out anything that remotely looked like a celt. The one from DiRi 38 is a classic, as I recall, with its flange to protect rotation in the socket. There’s also the interesting titbit below about use of nephrite for pressure flaking – you can get back to us on that ;-). Anyway, I suspect a lot of miscellaneous nephrite artifacts may be misclassed as decorative items, or as selvage or other waste products of the nephrite industry. As for NWC knives, it’d be nice if The Midden was online so we could look at the great article alluded to above by Bernick, describing the Scowlitz-area find of a hafted slate knife. The blades of these on the NWC tend to be much more sub-rectangular or mildly curved than lunate like an ulu. This is a decent example of a typical NW Coast ground slate knife blade, at least a complete one – frags are of course the most common piece! included by mistake in the study collection (Plate 9.5). task, or for use as a drill. 1974 Ground slates in the Scandinavian younger Stone Age with reference to circumpolar maritime adaptations. Proceedings of the Prehistoric Society 40:45–58. No Fitzhugh – the electronic presence of the Prehistoric Society reflects their name …. 2010 Kelly J. Knudson and Liam Frink, “Ethnoarchaeological Analysis of Arctic Fish Processing: Chemical Characterization of Soils on Nelson Island, Alaska.” Journal of Archaeological Science 37: 769-783. Interesting stuff here, especially correlating NWC stuff with the Arctic. Regarding those NWC nephrite drills, I am not so sure that they are drills. I did not examine them microscopically, but superficially, their bits are more like celt bits than any stone drill i have looked at. I suspect that these ones were used for carving fine details. I think a good use-wear study would be the only way to get at this, and indeed differentiate between chisel and adze functions for celts. To me, it is exceedingly interesting that NWC nephrite is almost never drilled. I have only seen about 3 examples of drilled nephrite from here, and all were very distant from the major production centres. To my knowledge, just about every other nephrite using culture occasionally drills nephrite. Yup, use wear on celts is going to be confounded, but not unsolvably so I don’t think, by the wear produced by resharpening the celt. For drills, you know,it wouldn’t necessarily take a good use wear study – drill wear is pretty darn characteristic and even if the nephrite drill is doing 99.9% of the grinding onto the object and not suffering much wear itself, it should still be pretty obvious. Also, Elfshot’s drills look like they have a custom end to the bit, so to speak – not that different than the coarse shape of the tip of a modern drill. Are there any nephrite whatzits with drilled holes? Was there use of the bow-drill on the Northwest Coast? Does the bow-drill ever precede the use of the bow-and-arrow? Anyway, yes, those cylindrical ones could be very fine, finishing-style chisels or gouges or something I suppose. PS I owe you an email but going AWOL again soon…. The larger nephrite drills that I’ve seen from Labrador have a cylindrical barrel that ends with two flat facets. The centre of the ridge between the two facets is slightly pointed, like the peak of a triangular tent with an extra tall centre pole. They can be resharpened by grinding one or both of those facets. As they are resharpened, more facets can form, but the general shape is maintained. Smaller ones seem to just have a simple awl type point. 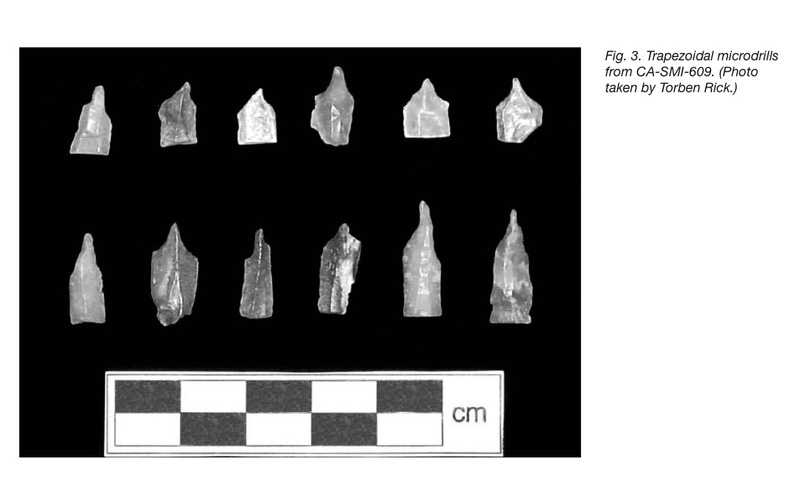 2000	The Archaeology of the Scowlitz Site, Southwest British Columbia. Journal of Field Archaeology 27:391-416. I hadn’t seen this before i did my replication work. I will take a look at some of those possible drills in some detail; there are a couple at UBC that are pretty accessible to. I will let you know what i see. I had an undergrad do about a dozen hours worth of chiseling cedar with some experimental nephrite celts i had made. The chiseling wear was distinctive compared to the resharpening. Notably chiseling did not produce the perpendicular striations that you see on many celts. I think that this is from adzing only. I did analyze a number of labrets and whatsits reported as nephrite (handmauls and lots of other odds and ends as well). Not a single one was nephrite. I don’t remember any being soapstone either (as they are often reported). From memory, they were all glacophane or serpentine. So drilled hole yes, nephrite no. Yeah, I know a lot of “nephrite” isn’t nephrite, I added to the stock of confusion myself I am sure….. This is the figure from the Lepofsky et al. Journal of Field Archaeology 2000 article you cite. It’s the same one as the Bernick article I am sure. It does look a lot like your replications but I guess there weren’t that many options! When you think of the mass production of stone and other beads at some sites on the Northwest Coast (I recently heard tell of one with multiple 5 gallon bucket’s worth, and more concretely at Tswassen a burial with >50,000), there must have been specialist drillbits but for whatever reason it doesn’t seem to me these are common in coastal assemblages. Maybe the bead-making sites haven’t been investigated yet (unlikely) or we aren’t recognizing the drill-bits (more likely, but still not very) or I am talking out of my hooha (most likely). Based on the quantities of these beads that show up in burials, there must be a ton of microdrills out there. I have never heard of one reported and i have never seen a microdrill in NWC assemblage. This could point to very localized production. Or, as some say, using screens in earlier excavations would have caught little things like these. These beads are worth an MA-sized project at least. There has certainly been alot more done with beads in other areas compared to here. So where are they? Over the years I think the cumulative sample of NW Coast sites is pretty good. Maybe Grant Keddie can chime in with evidence for coastal drills. You don’t get the flaked stone drills or the key shaped perforaters in any numbers, for example. And its not just microdrills, it seems to me – it’s all drills. So… what is left? Brainstorm time! 1. Bone drills misclassified as bone points. Possible, unlikely though I think – I mean sure they are common artifacts, but they do get looked at closely to get labelled, if nothing else. And, surely most drills or not going to be all that pointy anyway, more of a rounded tip item … so maybe misclassified awls/awl frags? It’s possible that drilling in slate might produce more of a polish from the rock dust than obvious circumferential striations….. Miscellaneous worked bone should be checked out, but I think someone would have picked up on this by now. 2. Those slate rods which sometimes get found. I don’t like this idea, they would show a lot of use wear I think and there should be a lot of them, and the rods I am thinking of are too big anyhow. 3. The drill bits were made out of wood. No, seriously. This solves the problem of why they don’t get found. A lot of abrasive technology depends on just moving a slurry of abrasive particles around — consider the Chinese method of cutting jade with string saws, or the reports of use of silica-rich cat-tail rushes for the same purpose. So little wood drills would move the slurry, be quick to make, quick to discard, low survivorship in the archaeological record. It might not have to be hardwoods either – cedar splints would work, but a fire hardened old growth Doug Fir heartwood or branch core would be as hard as bone, anyway. OK, it is hereby resolved that NW Coast drill bits were made of wood. Discuss. First of all, we need some metric data on the diameter of the holes in these beads. Then we will know the diameter of the drill bit we are looking for. In my experience, these beads have tiny holes. I would invision a drill based on a pressure flaked microblade would be about the same size. On the other hand, if we are willing to entertain the idea of wooden drill bits, how about sea urchin spine or porcupine quill? Doesn’t J. Arnold’s work on the Channel Islands show really spatially restricted distribtution of microdrills there? Same in Cahokia? The beads are most common in Marpole of course, which is not known for its microblades, though if I recall they exist in the Old Musqueam subphase (read: terminal Locarno Beach 😉 ). I think a stone drill-bit technology would have been found by now – I recognize these would be very small but there has been a fair bit of 1/8th inch water screening done now, and also, a lot of column samples. Also, there should be characteristic cores, as well? I’m not up on Cahokia drills. I really like the sea urchin spine idea! Strangely, not many illustrations, so another reason to love the internet is this paper by Torben Rick et al with the nice illustration below. Short story: these drills are incredibly common in those sites down there. Yes they are small but they are hyperabundant. Dietler cites a study which had a sample of over 800 of them. I think we’d have one by now up here. Edit: The Chumash thing is indeed interesting as an example of craft specialization. As you note Jesse, NW Coast beads could really support an intense study. Dietler’s thesis cited above also reviews the Cahokia case study and summarizes Arnold’s work on microblades/drills so it seems like a good starting point. OK, this is getting ridiculous: someone has already written a thesis on use of sea urchin spines as drills, case study: Channel Islands. It is available on scribd. 2008, Thesis, Dept. Anthropology, Northern Illinois University. SPOILER: urchin spines don’t work. At all. But it is a short thesis and maybe there is a way to unlock this technology somehow…. plus I just skimmed it. She says they may have been used to smooth out the inside of holes drilled with stone microdrills. She also tests metal needles, which worked well, but this was using a “punch” technique. Well, I guess that demonstrates that 2 people can come up with an equally original and equally implausible idea without having ever met. What about bird bills or some sort of tiny tooth as drills? Also of note, the recent CRM mega project at Golden Ears apparantly unearthed something on the order of 300 000 beads made of a hard clay-like stone. And apparantly not a single drill either. What about the use of quartz crystal drills for the manufacture of beads? There are some sites of vancouver island where relatively large quantities of small quartz crystal pieces (possibly drills) as well as ground stone beads have been found (example being the False Narrows site on Gabriola). Also,I’m pretty sure Grant Keddie has replicated ground stone beads using drills of hafted quartz crystal…. Another type of drill has been identified in NWC assemblages — the bird-bone drill. Identified by Becky Wigen of PacificID while examining faunal collections, and published (possibly in The Midden?) The bit ends of the tubular drills showed almost microscopic serrations created by pressure flaking. I assume the drilled hole would be tubular rather than biconical. Would they have been effective in the manufacture of stone beads? Since her article, I’ve found ethnographic reference to the use of these drills, in Sproat, “The Nootka: Scenes and Studies of Savage Life”, 1868. The context is drilling cedar [a soft wood…] in canoe making. You could butcher and process a salmon with a wooden knife of perhaps exactly the same shape as those ground slate ones illustrated above. Generally speaking, the peoples of the NWC were ingenious woodworkers and problem-solvers. Why wouldn’t they reach for a wooden solution before a stone one? One thing we need to keep in mind is the size of the holes being drilled – mostly 1-2 mm diameter I would guess. As “sniffer” says tiny quartz crystal drills are an option. These might indeed be too small to have reasonably been fund by most excavation techniques used. But it strikes me that wood is still a pretty good option, as Skeptical Archaeologist says. Easy, expedient – just need some experimental work to see if they would be effective. Or colour me Gullible Archaeologist. Anyhoo, obviously the peg has to fit the hole, and the holes are often a mm or so in diameter. These are good ideas. I have also drilled holes thru slate using quartz drills. I have also microscopically examined a pretty good number of quartz crystal microflakes and have not seen any evidence of drill or sawing hard materials, and based on my experimental collections, these are very easy wear-traces to detect. As Quentin mentioned above, there is alot of negative evidence for these microlithic drills – simply no one has ever mentioned one. I am also very skeptical about wood drills. In the absence of a hard abrasive, i don’t think wood drills would penetrate anything but soapstone/steatite. It would also be technically very difficult to make a 1mm diameter wooden bit. What about cactus spines? Lets not forget that iron/steel is known on the coast from drift wrecks for a very long time, nearly 2000 years? Small metal drill bits might not survive in sites, and even if they did might not be recognized if heavily oxidized, or if collected might be dismissed as intrusive historical materials and devalued in reports. How often in NWC archaeology do you see iron (historic or prehistoric) analyzed, x-rayed and cleaned up by a professional conservator? I can only think of a couple of examples, though I am sure there are more. In any case, there is probably a lot more that should have been done. And since stabilization and conservation is quite urgent upon excavation, such materials if not properly dealt with at the time of excavation may have crumbled away in their collection bags. This is by way of saying that there may be a strong bias against metal drills being recognized in NWC archaeological contexts, and that such items may not be very conducive to a retroactive search of existing collections since they may not have survived the excavation and storage processes. Sorry for this fluff addition but I cant help but think of how many cool archaeological problems we are now collectively thinking about thanks to a discussion forum like this. Thanks everyone(Q too). Boas 1905: 322-323 “Drills. – Drills (sElE’m) vary considerably in size. They consist of a bone point more or less quadrangular in cross-section, which is hafted in a slightly tapering handle made of cedar-wood. The tang of the bone point is always square; so that when the drill is twirled, it will not become loose in the haft. Boas has a drawing of the drill on page 323. I really doubt it that anyone could make a functional drill with a 1-2mm bit out of bone or wood. Someone can prove me wrong perhaps. The iron is a good idea for later periods. 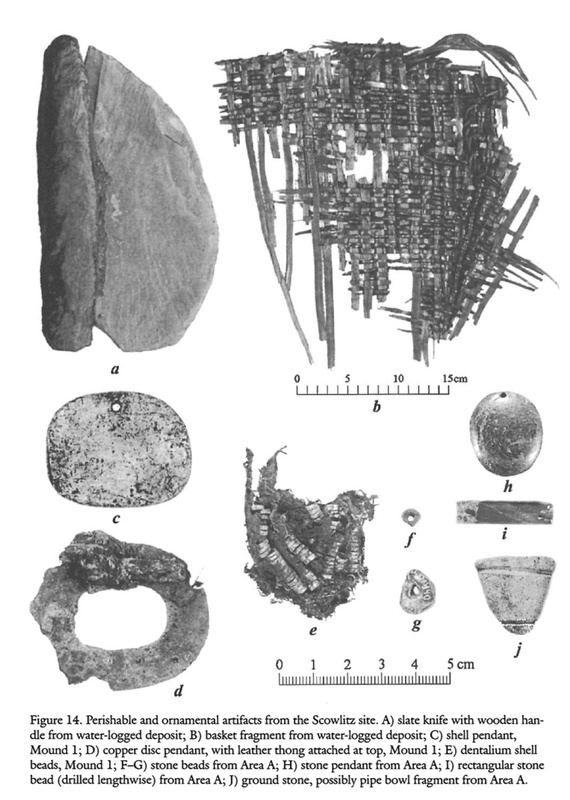 But for these early beads ~Charles age, this is before east asian iron working even. Whatever they used to drill tiny beads during Charles/Locarno should work just as well during Marpole. I think that someone should look at the possibility of using little pointy teeth as drills. If you had a salmon mandible, you could use one of the fore-teeth as a drill bit and rotate the mandible in your hand. These folks would have probably had plenty of salmon jaws to go around. Thoughts? Teeth are a good idea, there are lots of animals with teeth about the right size. However, bones and teeth, including or especially fragments, get an awfully close look by the better faunal analysts and I would expect that if these were in common use, they would have been noticed by now. After all, it was a faunal analyst (Becky Wigen) that brought to our attention the bird bone drills 20 years ago and she has been looking at archaeological bone ever since then, from all over the NWC and all time periods. It is interesting that these small drills are not known. Seems that the discussion above suggests a couple of reasons – isolated workshops that have not been excavated, wood or other commonly perishable material not usually found in sites (and even if found might have eroded surfaces that would not show use-wear), sample bias from excavation methods or screen size (but lots of 1-2mm dia bone points have been found, even in 6mm screens), sample bias from preconceived expectations, and perhaps a suggestion that because they are small and made of a material that is not usually associated with artifacts they have been overlooked. My money is on a combination of factors – small and thus overlooked but more prone to taphonomic disasters and thus a lower rate of survival, as well as sampling bias. Most likely they are made from more than one material, especially if they include use of an abrasive compound. Whatever they are made of, I think the drills will work quickly and efficiently – there are just too many of those beads around for it to have taken more than a few minutes to drill the holes in the bead after shaping it (I heard of a burial excavated this year with an estimated 300,000 stone beads in it and another with 6-7,000 beads). Someone will have worked out a way to do it quickly, I think we can count on that. I’ll suggest that we relegate this idea to the bin of recurring but unchecked assumptions about slate knife making. Archaeological data from Late period and Contact/Colonial period deposits in the upper Fraser Valley compellingly demonstrate that this assumption is false. Slate knife-making activities in these parts have several recurring material correlates, and knife-making debitage *dominates* assemblages in these parts. 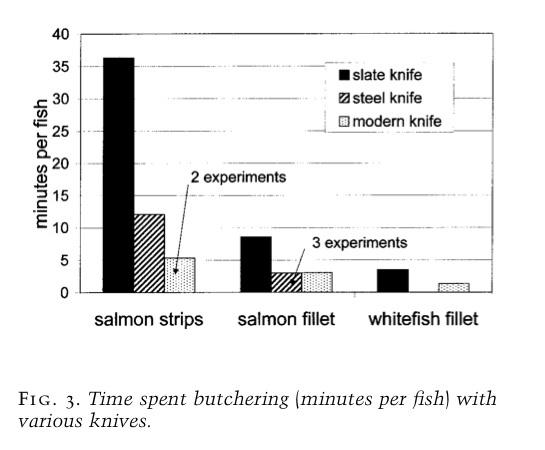 I’ll take it a step further and suggest that not only is evidence of slate knife making particularly abundant in Fraser Valley sites, but the further study of the evolution and intensification of slate knife-making activities will provide important insights into the timing of intensified salmon fishing at the level of the household. Great blog and thought-provoking contributions. Hi Anthony, thank you for your useful comment and welcome to the website. I’ll readily admit to being wrongly spoken about the slate knife debitage. I mean, stupidly wrong, because I have been collecting slate debitage for years, sometimes with resistance. The resistance comes from the notion that you can’t tell it is cultural because it very rarely has “flake attributes” and so is not distinguishable from hypothetical natural slate shatter that might have somehow got onto the site via natural agency. So, yes, ground slate knife production leaves an extensive trail of debitage and I stand corrected on the above. Also, as you note in your papers, the flaked slate knife with no grinding is itself an artifact type in the coast, especially Locarno Beach times, and in fact is not a particularly uncommon artifact type. Comparably, I noted in my MA thesis how there are a lot more nephrite selvages and manufacturing waste in the Canyon than the valley, and this is itself was suggestive of manufacturing loci. Useful data from a sample that is unprepossessing. Having said that, what can we really learn from slate debitage? Your recovery program in the 2009 publication looks meticulous and at a quantitative level of “greater than or less than” I can see the slate shatter being interpretively useful, e.g., your HP to HP comparison. Maybe my question is comparable to a crusty fart ca. 1970 asking “what can we learn from (flaked/conchoidal/non-slate) lithic debitage”? Well, what indeed – but I think most would agree that the various diagnostic landmarks on flaked lithic debitage give it a huge head start. Anyway, as noted, just the numbers alone of slate flakes can be important. I can see some have cortex as well, that could be useful. Then what? Size? Shape? Mass analysis of slate flake shatter? Can a dorsal vs ventral distinction be made? I honestly don’t know where I’d go with this, but I do collect the damn stuff anyhow. 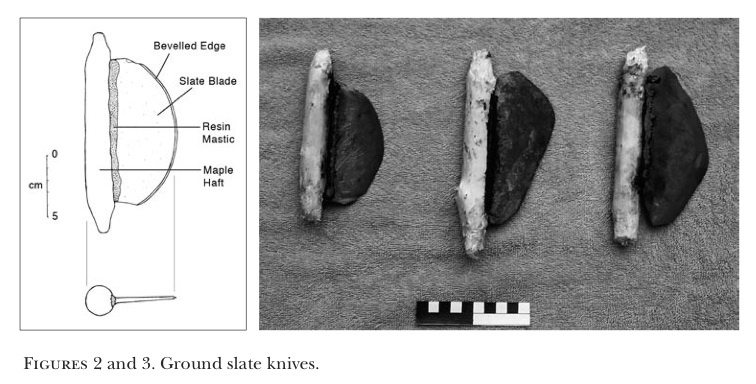 I hope this data class continues to get analytically pushed (and aggressively collected) because the story of the ground slate knife has itself been assigned high importance in some models of cultural change on the coast. So anything we can learn about it is valuable. But I would say, so far, the recognition of slate debitage provides more information than one might think, yet still less than we might eventually hope for. Maybe you can find a great PhD student to really drill (heh) down into this topic. I just learned more about lithic drill technology in 10 minutes thank I did in 3 years of reading books! Fantastic!